We heard Mike Huckabee mention French philospher Jean-Francois Revel on TV recently. Ravel believed that in a democracy, people could vote themselves so many benefits that the nation-state would collapse in debt. We mention this as President Obama plans to borrow money and create debt to reform health care; bailout all homehowners with difficult mortgages; bailout AIG, Ford, GM, Citi, and a host of others; pay unemplyment insurance; reform our energy industry to eliminate oil, gas and coal, and more….And he has promised 98% of Americans a tax cut while proposing to increase taxes on those that create the most jobs (and wealth). Whoopi doesn’t like getting taxed out the wazoo. And neither does anyone else…. 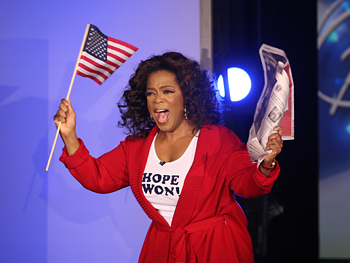 Well, maybe Oprah doesn’t mind more taxes for her pal Barack…. “Strangely, it is always America that is described as degenerate and ‘fascist,’ while it is solely in Europe that actual dictatorships and totalitarian regimes spring up.” From Europe’s Anti-American Obsession. A similar statement can be found in his book Anti-Americanism, Encounter Books, 2004, p. 156 (paperback). “Democracy may, after all, turn out to have been a historical accident, a brief parenthesis that is closing before our eyes.” With those words, French philosopher Jean-Francois Revel sounded an alarm as the ramparts of democratic conviction were under attack by the political left. Revel, one of the most important conservative thinkers in France, saw European intellectuals and the political left in America undermining the very foundations of democracy. As Revel lamented, at times the democracies seemed to find strange comfort in calls for their own destruction. As he observed, “Democratic civilization is the first in history to blame itself because another is power is working to destroy it.” Were democracies doomed to self-destruct? Jean-Francois Revel is well known as a shining light of reason in the French academy. Long a columnist, editor, and director of L’Express, Revel is also the author of a multi-volume history of philosophy. He sprang to Western attention with the publication of his controversial book, Without Marx or Jesus. Revel’s later volumes would include The Totalitarian Temptation and Democracy Against Itself. Of course, the alarm sounded by Revel in How Democracies Perish was overtaken by history with the fall of the Soviet Union and the remarkable events of 1989 and 1990. As Revel later reflected, the good news revealed in the fall of the Soviet Union was the fact that its internal weaknesses were even greater than the self-hatred of the secular left in Western democracies. Now, twenty years after How Democracies Perish, Revel looks to the aftermath of the September 11, 2001 terrorists attacks and asks the fundamental question: Why do so many Europeans hate America? This is not a question of merely academic interest. Revel senses that something fundamental is revealed in the way the European Left has responded to America’s status as the world’s only super power. The virulent anti-Americanism that erupted on the streets of Europe in the aftermath of America’s military action in Afghanistan and Iraq did not emerge from a vacuum. Revel’s interest in anti-Americanism is rooted in his own experience as an French intellectual who actually visited the United States. When Revel first visited America in 1969, he discovered a land very different from what he expected. Having planned to write a book on the problems of the United States, Revel instead wrote a treatise criticizing the irrational anti-Americanism of the European Left. Now, he has done it again–and this new book may be even more important. As Revel notes, since the Greek prefix “hyper” has exactly the same meaning as the Latin “super,” Mr. Vedrine is merely seeking to score political capital in his own nation and in the larger European neighborhood. As Vedrine stated, “We cannot except a politically unipolar and culturally homogenized world, any more than the unilateralism of the single hyperpower.” Exactly what Mr. Vedrine meant by this, no one seems to know. Nevertheless, it is an example of French hyperventilation posing as foreign policy. The United States is far from perfect, Revel acknowledges. Nevertheless, he suggests that any criticisms should be directed at real problems, and should not take the form of irrational rantings. According to Revel, the European Left enjoys its fantasy of America as “the worst society that ever was.” According to this cartoon of reality, America is a society that is entirely under the control of money-grubbing plutocrats. Everything is for sale and the entire culture has been commodified. The problem is not just George W. Bush, for the European Left is convinced that every recent American president “has been in the pockets of the oil companies, the military-industrial complex, the agricultural lobby or the financial manipulators of Wall Street.” But, in the French view, George W. Bush is just the worst of the lot–at least as yet. The European Left is also convinced that America is primarily marked by poverty. As Revel describes the Leftist fantasy: “Hordes of famished indigents are everywhere, while luxurious chauffeured limousines with darkened windows glide through the urban wilderness.” These same thinkers are convinced that violence reigns throughout the United States, and that gunshots commonly ring through even the most peaceable neighborhoods. As Revel acknowledges, European rants about America’s lax gun laws would have more credibility if the same weapons were not easily available for purchase through the black market in virtually every European city. If this picture of America is true, the pattern of immigration from Europe to the United States throughout the twentieth century was absolutely irrational. “If the picture of American society drawn everyday by the European press is accurate, then we must believe that those tens of millions of immigrants from all parts of the world, and especially those who came from Europe between 1850 and 1924, were all deluded fools. Otherwise, why did they insist on staying in the American capitalist jungle with all its evils and not return to the lands of peace, plenty, and liberty they came from? Lost in a hellish cultural wasteland, why at least didn’t they write to their families and relations basking in the paradises of Ukraine, Calabria and Greece warning them not to come to America?” Clearly, Revel does not mince words. Jean-Francois Revel is a brave man who has lived through some of the most tumultuous decades of human history. Though a realist, he is not without hope. He has sounded the alarm more than once, only to have the Left ignore his cries. Anti-Americanism is Revel’s latest attempt to call the trendsetting intellectuals of Europe back to sanity. Good luck, Professor Revel. This is no easy task. Revel’s prescient warning to the European Left should also serve to educate thoughtful Americans about the challenge we face in Europe, which may be as daunting a challenge as that posed by Islamic terrorism. Something sick lies at the heart of Western civilization. The democracies that will surely perish will be those who cannot tell the difference between good and evil, survival and ruin, freedom and tyranny. Or, perhaps more to the point, the greatest danger faced by democracy are those who deny that there is any real difference after all. So much for summoning the country to sacrifice. Obama has been no more willing to ask average Americans to pitch in, even once the recession is over, than Bush. Oprah’s Literary Liars Club: Who Is Responsible? Another 651,000 jobs disappeared from the American economy in February, the government reported Friday, as the unemployment rate soared to 8.1 percent — its highest level since 1983. The latest grim scorecard of contraction in the American workplace largely destroyed what hopes remained for an economic recovery in the first half of this year, and added to a growing sense that 2009 is probably a lost cause. Most economists now assume that the American fortunes will not improve before near the end of the year, as the Obama administration’s $787 billion emergency spending program begins to wash through the economy. Indeed, the monthly snapshot of the national employment picture worsened an already abysmal picture…. While usually a “conference committee” between the House and the Senate on a spending bill irons out differences btween the two chambers on the measure; nothing has been usual about the “emergency relief” or stimulus bill so it may follow that the rules and norms of the confernce will not be norms at all. The Senate cut out some favorite spending programs of the House — primarily tens of billions of dollars in aid to states and local governments, tax provisions, and education, health and renewable energy programs. The competing bills now reflect substantially different approaches. The House puts greater emphasis on helping states and localities avoid wide-scale cuts in services and layoffs of public employees. The Senate cut $40 billion of that aid from its bill, which is expected to be approved Tuesday. The Senate plan also focuses somewhat more heavily on tax cuts, provides far less generous health care subsidies for the unemployed and lowers a proposed increase in food stamps. Pelosi and many in the House don’t like those tax cuts and are expected to work to restore items like the health care and food stamp money. The Senate plan also creates new tax incentives to encourage Americans to buy homes and cars within the next year. In the Senate there are several Republicans waving a Congressional Budget Report that says in the long term the stimulus will slow investment and add to the debt. And there are those like John McCain and Lindsey Graham wondering why there is no defense sepending in the bill. 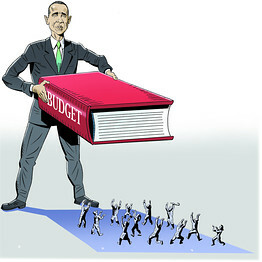 “During the transition, the Obama team advanced three principles about stimulus spending: It should be timely (putting dollars into economic circulation rapidly), targeted (of clear value to the nation) and temporary (not a new and permanent entitlement or long-term program that would make the government’s finances even more problematic). Plus the pressure will not subside on the lawmakers: from the White House, voters, talking heads, news media and even bloggers. Whatever its flaws, the stimulus package could create or save as many as 4 million jobs by the end of next year, helping to offset the 3.6 million jobs lost since the nation slid into recession in December 2007, according to an analysis by Allen Sinai, chief global economist for Decision Economics. “This is a seismic shift in the role of government in our society,” said Sinai. “Those who believe the government can be an effective, positive instrument for good will have another chance to try it,” said Sinai, a political independent. No matter the color of your work shirt, this recession is sparing few. From blue collar construction workers to white collar financial sector employees, the economic crisis has dragged a growing swath of American workers into joblessness. Economic downturns predominantly used to hit blue-collar and young workers. But in this recession, layoffs and business closings are affecting bankers, middle managers, even scientists and journalists. White collar unemployment jumped 1.6 percentage points — to 4.6 percent — from December of 2007 to December of 2008. But blue-collar workers are still bearing the largest brunt of unemployment, at 11.3 percent. The shared pain helps explain the varied priorities in the $800 billion-plus rescue package put together by President Barack Obama and Democrats in Congress. The $50 billion for building roads, bridges and schools addressed the hardest hit of the unemployed first — hardhat workers. But there are also piles of wage-producing money for college-educated workers: $62 billion in the House version for health information and renewable energy technology, improving the nation’s power grid and scientific research. Getting it all to them will take longer. Policymakers are also counting on greater public acceptance for social spending — on the likes of food stamps, unemployment and health insurance — because the victims of the collapse in housing and credit markets cross socio-economic levels. Republicans complain that too much is being directed to expanding the safety net for assisting victims and argue that tax cuts, particularly those addressed at businesses, will produce more sustainable jobs over the long term. You are currently browsing the archives for the food stamps category.